Mrs. Fields has partnered with Rovio Entertainment to offer Angry Birds-branded cookie boxes and cookie cakes. 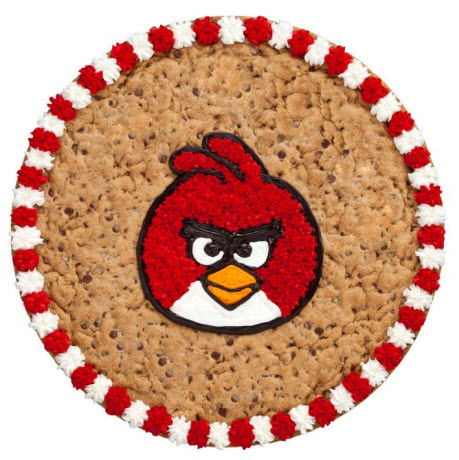 An Angry Birds cookie cake is pictured above. The Angry Birds cookie boxes will feature six cookie nibblers and an eight cup of milk. The cookie cakes will be available with different birds, including Red Bird, Pink Bird and Blue Birds. Angry Birds milk and cookies boxes will cost $3.49. The Angry Birds cookie cakes will range from $26.99 to $39.99, depending on size. The items will be available from now until the end of 2014.